BOSTON -- Orioles starter Ubaldo Jimenez was tossed Friday night for hitting Boston Red Sox slugger Pablo Sandoval in the right shoulder with a pitch, an ejection that Baltimore manager Buck Showalter later called "professionally embarrassing." Jimenez was thrown out by plate umpire Jordan Baker in the fourth inning after the right-hander hit Sandoval with the first pitch and two outs. He had allowed no hits and three walks to that point. No warning had been given beforehand. "That's the thing: He didn't give me a chance to react or anything," Jimenez told reporters of his first career ejection. "Without any warning. There's no history. I'm cool with Pablo outside of baseball. You can ask him. "Especially against a left-handed hitter, you aren't trying to go down. You are trying to go up. I had three walks. It's not like I had perfect command of my fastball. I was shocked." Two innings earlier, Sandoval upended Orioles second baseman Jonathan Schoop with a hard slide on a forceout. Crew chief Jerry Meals said Baker believed Jimenez's throw at Sandoval might have been in retaliation to that. "After they showed the replay on the board, Jordan saw the Orioles' dugout, and it seemed they reacted to the slide, and then Pablo's next at-bat, first pitch to him, fastball in," Meals said, according to MLB.com. "It's close to the head. It was a dangerous pitch, so it's an automatic. You can give a warning if you prefer to, but he felt it's an ejection." The Orioles led 1-0 at the time of the ejection. 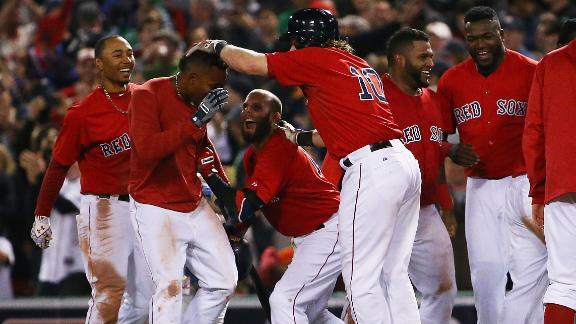 The Red Sox, thanks to shortstop Xander Bogaerts' walk-off single in the ninth, went on to notch a 3-2 win. "I guess [Baker's] thinking that someone's mad about somebody sliding hard," Showalter told MASN Sports. "I mean, we all aspire to play the game that way. It's quite franklyprofessionally embarrassing. What it does [to] your whole bullpen for the rest of the trip, I mean we had to use people we wouldn't normally use." Showalter said he hopes the league steps in and takes action. "Quite contrary to what people think, every time somebody gets hit [with a pitch] it's not intentional," he told MASN. "And we applaud anybody sliding hard or playing the game right. We try to do that, too. ... It's just unfortunate that something like that gets involved in the game and now it really sets our bullpen with some challenges. I'm hoping that MLB will take the proper steps to make sure they know that was incorrect. It was pretty obvious to everybody." Sandoval, for his part, was surprised by the ejection. "I don't believe so," he said when asked whether he thought Jimenez's pitch was intentional. "That's part of the game. Taking one for the team." Red Sox manager John Farrell felt the same. "Honestly, yeah. A little surprised," he said. "Because I didn't see anything that would have warranted a hit by pitch. But, obviously, Jordan felt like there was clear intent. And whether or not he felt because it was the hard slide at second base, that I don't know. It was quick." Information from ESPNBoston.com contributor Kyle Brasseur and The Associated Press was used in this report. Baseball Tonight Spotlight: Boston shortstop Xander Bogaert's single in the bottom of the ninth inning brought in Mike Napoli for the game-winning run against Baltimore.